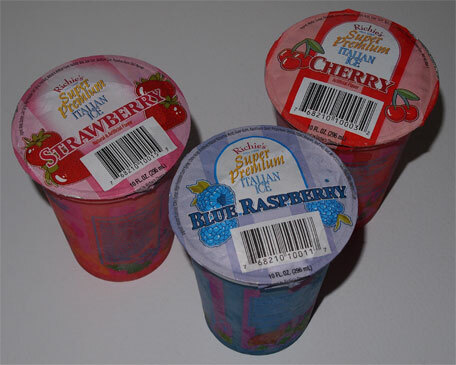 I know these aren't new, but I want to mention these 10 ounce cups because they've been popping up all over the place at a buck a pop. [Until now, I've only seen them at outdoor festivals for 2, 3 even 4 bucks a pop]. Cherry first, because, well, that's my favorite Italian ice flavor. Hmm, the big container takes awhile to melt. Flavor is fine, texture is fine. It's got a bit of sweet, sugary cherry bite which is nice and it is what it is. My only real thought at the moment is that besides consuming one of these on a super hot day, there's no way I need 10oz of Italian ice. I kind of wish it came with an official lid so I could more easily stick it back in the freezer (I know, saran wrap will work too). Ok, strawberry next and it's definitely sweeter (and there's less of a bite). There's almost a watermelon flavoring to it. Scooping Scooping... CRACK, right in the side of the container. Uggg, apparently I need to be more careful.... oh and I just made the crack worse. FYI: cracking the container is a possibility, if it happens, just start scooping on the other side. So, overall, nothing wrong here, just a sweet, mild strawberry flavored italian ice... that's cracked. [Good thing I have a paper towel around this thing]. On Second Scoop: It's kind of boring and took me three servings to finish. Ok, blue raspberry last and it's.... iunno, I don't know what to make of it. It's not disgusting like many blue raspberry flavors, but at the same time, I don't seem to be getting any particular flavor out of it. It's blue flavor. There's something more, more bite or something (compared to the strawberry), but a specific flavor eludes me. I managed to finish this one in one serving as well, but the last 2-3 ounces were completely meaningless. Update: it's morning.... tongue still blue. And they're all gone. Will I buy anymore? Nahhhh. These aren't particularly bad, it's just that 10 oz is too much. I know I could save them, but what's the point. I don't want to wait for this larger serving to melt enough to eat it. I'd rather have a smaller Lindy's Italian ice or a freeze pop. I LOVE Ritchies Italian Ice!! nice size, huge flavor and now I can't have just regular Italian ice, I NEED to have Ritchies!